After a thrilling eight months full of events online and on the ground in over thirty countries around the world, the Stop Poverty campaign came to a close at 5:00 a.m. Paris time on October 18, 2017, as the last contributions to our World Day for Overcoming Poverty WebTV were aired. With the campaign launching on February 12, 100 years after Joseph Wresinski ‘s birth in a refugee camp, the year covered the 60th anniversary of the founding of ATD Fourth World as well as the 30th World Day for Overcoming Extreme Poverty. These anniversaries offered us a unique opportunity to reach out to new people and new communities with the message that we must all come together in partnership with people living in poverty if we are to overcome poverty. This year was a marathon and a sprint at the same time. Together throughout these eight months we managed to reach hundreds of thousands of people around the world, bringing in support from dozens of organizations on the local, national, and international levels, and to draw new energy into this global movement to end extreme poverty in partnership with those who live it. While truly appreciating the final impact of the Stop Poverty campaign will no doubt take some time, we thought it useful, at this early stage, to remind ourselves of some of the highlights of the year and try to put all the many and diverse events and initiatives that made up the campaign together into a larger context. This is our way both of sharing with you what made this campaign so special, and thanking you for having played a key role in it – in whatever way you were able to contribute. While the Stop Poverty campaign may have come to a close, the real work of fighting to overcome extreme poverty will continue, and we are so glad to have you as part of this movement. We are looking forward to the coming year with new energy and momentum with your continued and active support. At the heart of this campaign was the call to action on the Stop Poverty website – poverty-stop.org. 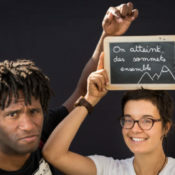 Online, over 6,000 people added their name and photo to the Stop Poverty mosaic, including the President of the UN General Assembly, the Grand Duchesse of Luxembourg, the Mayor of Paris, the Administrator of the UNDP, and numerous Ambassadors and members of Parliament from around the world, alongside activists and people living in extreme poverty. In local events across the globe, more than 10,000 people joined their names offline thanks to the campaign. This is an extraordinary achievement, and one that opens up may avenues for future cooperation with this diverse set of stakeholders. 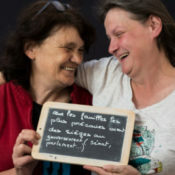 Over 150 Stories of Change, chosen from among hundreds we received during the year, have been published in English, French and Spanish, both online (in English at storiesofchange.atd-fourthworld.org) and in print. These stories from over thirty countries around the world have been read tens of thousands of times, sharing inspiring stories of success in the fight to overcome poverty. 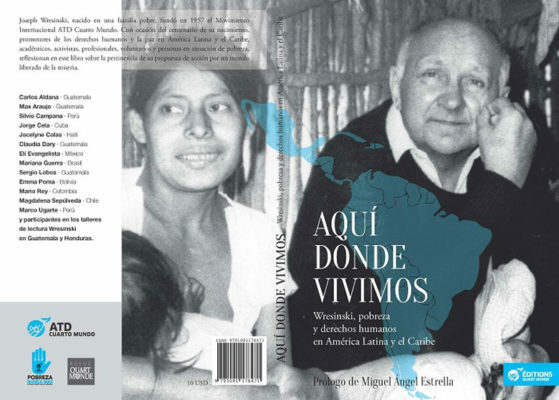 • In Latin America, authors from eight countries contributed to Aqui Donde Vivimos, an exploration of Joseph Wresinski’s legacy in Latin America. • In France, Le monde Changera Un Jour was a collection of short stories selected in a national short story writing contest. • ATD Quart Monde: UnisContre la Misere by Erik Orsenna, a collection of photos and text, was published in France to commemorate the sixtieth anniversary of the founding of ATD Fourth World. From the beginning, music was a huge part of this campaign. Building on the legacy of the 100,000 Voices for the Voiceless campaign that marked the first World Day for Overcoming Extreme Poverty, the Stop Poverty campaign launched a choir songbook including music of struggle and dignity chosen by people living in extreme poverty and those who work alongside them around the world. The songbook was printed over 2,500 times, running into its second edition. There were over 100 major concerts organized in France, Ireland, Belgium, Guatemala, Canada, Central African Republic, Great Britain, the United States, Switzerland, Spain, and Luxembourg, and many others small concerts elsewhere. Throughout the year there were benefit concerts including musicians performing classical music, pop music, hip hop, and much more. 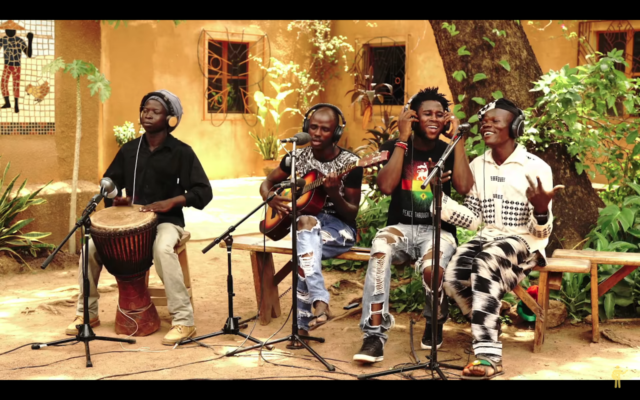 The Song Around the World video co-produced with Playing for Change has been seen over 175,000 times and counting. 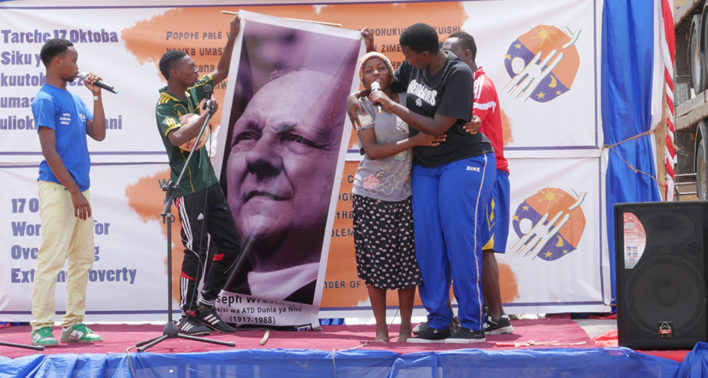 • On Feb 12th the campaign launched with events in Angers, Bangui, and New York which told of the origins of ATD Fourth world and Joseph Wresinski’s youth growing up in extreme poverty. • In June in Cerisy la Salle in France an international seminar brought together researchers, practitioners, and people living in poverty from every continent for one week to reflect on the ways the work of Joseph Wresinski and the voice of those living in extreme poverty force us to rethink our world. The content of the conference will be published in book form in 2018 and videos covering the major presentations are available online in English, French, and Spanish. • In July in Frimhurst, UK, hundreds of people came together to commemorate the 60th anniversary of the founding of Frimhurst Family House, a place of friendship where families living in poverty come together to escape the daily stresses that define their lives. • In August in Wijhe, the Netherlands, over 100 young people from a background of poverty from 10 different European countries came together to talk about the challenges they face and the paths toward building a Europe without poverty. • In August, in Guatemala, people from across the country came together to celebrate the birth of of ATD Fourth World in a remote village in the mountains. 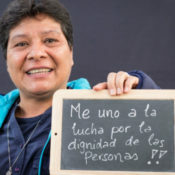 Founded in the midst of the civil war, ATD Guatemala has since grown in different villages and cities and contributed to major changes in the educational and cultural policies of the country. 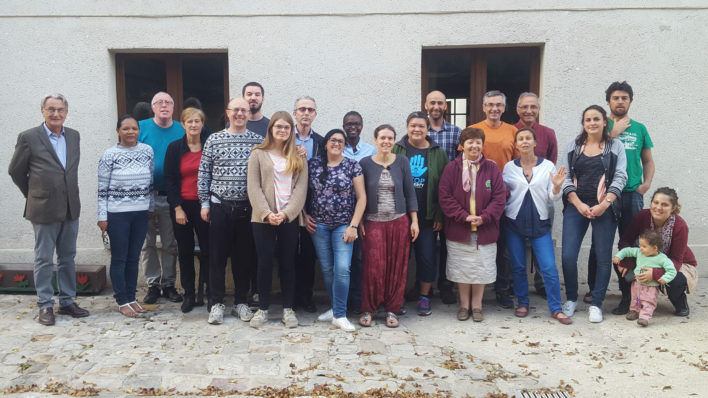 • In October, just before the 30th World Day for Overcoming Extreme Poverty in Paris over 30,000 people came to visit the Village of Initiatives for a Better World, a showcase of positive initiatives for a world without poverty ranging from street libraries to political lobbying. With coverage in national and international media, the campaign hashtag #stoppauvrete was trending in Paris throughout the weekend. Our partnership with RFI (Radio France International), was key in generating over 75 radio stories broadcast on close to fifty partner radio stations on every continent, reaching millions of people. The campaign was also featured on TV in Guatemala, Belgium, France, Burkina Faso, the Democratic Republic of Congo, and elsewhere, as well as in print media in every continent. For the 30th World Day for Overcoming Extreme Poverty, more events than ever before were organized and, thanks to our 24 hour webTV, shared with the world. • In the Philippines, a live stream launched the day with the official national commemoration. • In Dakar, Senegal, young people from throughout West Africa came together for one of the most festive events of the day. • In Dublin, Ireland despite a rare hurricane having ravaged much of the island in the days before, a large crowd gathered to share the day with the world, with so much support that#StopPoverty was trending on social media in the Dublin area throughout the day. • In Paris, France thousands came together at the Trocadero Human Rights Plaza where the first World Day for Overcoming Extreme Poverty was celebrated thirty years before. • In New York, at the United Nations, an international delegation of people living in extreme poverty spoke alongside diplomats and development professionals at the official commemoration of the International Day for the Eradication of Poverty and forcefully challenged the community of nations to do more, and be more determined, to end poverty in all its forms and build societies that leave no one behind. • Closing the day out in Guatemala, people living in extreme poverty came together to speak on stage with government officials about the violence that is tearing apart their communities and robbing their young people of hope for a better future. In addition to the almost 5,000 people who tuned in to watch the WebTV on the Stop Poverty website, Facebook Live broadcasts of the event reached tens of thousands more. Among all the ways for people to get involved in the Stop Poverty campaign, social media was one of the easiest and most popular. • The three campaign hashtags, #StopPoverty, #StopPauvrete, and #Pobrezanuncamas, were all trending at one point during the eight months, accumulating millions of impressions over that time. • Our October 17 Thunderclap reached almost 700,000 people. • The campaign website homepage was shared on Facebook thousands of times. • Videos made for the campaign, ranging from Joseph Wresinski: Revisited (more than 250,000 views) to the campaign trailer (10,000+ views), clips from filming with Playing for Change in Haiti (15,000+ views), and others led to over half a million views online over the course of the campaign – a number that is still growing every day. Perhaps more important than all these numbers though is the intangible energy we have felt throughout the year in every aspect of this campaign. Whether it was groups tuning in to the WebTV from rural areas where there was no event they could take part in, volunteers coming together to write a story and tell of the work they are proud of and that is so dear to their hearts, or people organizing concerts, signing the call to action, and much more – the movement to overcome extreme poverty has never felt so real and so strong. The tremendous support we received from over twenty civil society partners was another testament to this – including the International Trade Union Confederation, Social Watch, the European Anti-Poverty Network, the Global Call to Action Against Poverty and so many others. As much as any number it is that energy and the concrete actions that came with it, that give pride to people in poverty and courage to continue their daily struggle to be respected and heard, and to take action with others to stop poverty. It gives us confidence that new allies have been gained this year and that our message that we must all come together in partnership with people living in poverty if we are to overcome poverty, has echoed around the world. That movement is all of you, and we are so grateful to be engaged in this struggle together. Now the time has come to move forward and continue to build a world without poverty.